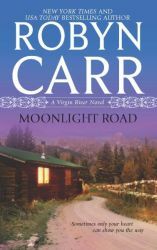 Last year I discovered Robyn Carr and her Virgin River series which is a series of books set in northern California, around a close knit community in a small town. I’m not usually a huge fan of quiet and subtle romances, but I quickly devoured the books in a short frame of time – although I did find that the original trilogy more engrossing with the original set of characters, especially the first book which I adored than the subsequent books. In Forbidden Falls, Noah Kincaid is a preacher who recently purchased a derelict church in Virgin River. He hires Ellie Baldwin to assist him in his duties. Noah is a classic Beta hero; sensitive, compassionate and with a great sense of humour. And he soon finds himself very attracted to Ellie, who is fun, outspoken, brassy and is not an assistant that he originally envisioned to help him out. Nonetheless, Ellie is the perfect emotional foil to Noah and I thought their interactions was fun and filled with humour and I loved the dialogue between them. Both Ellie and Noah are the perfect case of when opposites attract, and I really loved how Noah was portrayed throughout the whole story. He was a fully fleshed out character as the point of view of the book was within his perspective. This is pretty rare for a Virgin River book, as it would jump to many of the perspectives of other characters – including past ones. However, I did enjoy this approach as it really focused on the romance which some of the other books failed to do, but unfortunately at the same time, it affected the characterisation of Ellie. For a vibrant character, I really think she needed to have more insight, and at times she felt one dimensional and clinched – especially with her background and issues. Robyn Carr is pretty good at fleshing out and avoiding stereotyped traps in her characters. I just wished Ellie had more depth, and although the second half of the book improved – where we had more of point of view – I felt it could have been much better because Ellie’s character’s potential was quite fun. She was mouthy and had an upfront attitude, so it would have been fun to see her insights from her perspective. I felt her character only came alive for me with her scenes with Noah. However, I do think this was a good romance. I just think that there were lost opportunities where it could have been a wonderful romance. Nonetheless, Noah and Ellie’s characters are a fantastic addition to the community of Virgin River, and I really hope we get to see more of them in future books. Four years ago, Air Force sweethearts Franci Duncan and Sean Riordan reached an impasse. She wanted marriage and a family, he didn’t. But a chance meeting proves that the bitter breakup hasn’t cooled their sizzling chemistry. Sean has settled down in spite of himself—he’s not the cocky young fighter pilot he was when Franci left, and he wants them to try again. After all, they have a history…but that’s not all they share. Franci’s secret reason for walking away when Sean refused to commit is now three and a half: a redheaded cherub named Rosie who shares her daddy’s emerald green eyes. Sean is stunned—and furious with Franci for the deception. News travels fast in Virgin River, and soon the whole town is taking sides. Rebuilding their trust could take a small miracle—and the kind of love that can move mountains. I am not a Secret baby trope fan because the reasons behind it are usually very silly, and I find it to be a forced obstacle for the protagonists involved. But I could sort of understand Franci’s reasoning on why she kept her child a secret, especially since Sean’s attitude about their relationship was so casual. And it was only when she left him – because she wanted a more serious commitment, when he didn’t – that Sean realised he loved her. I think this reasoning felt flat for me, more so with Sean. His chance encounter with Franci in the bar was like: Woah. This is the woman I lost and loved! And was a fool before, but not I’m serious. That didn’t wash for me. He could have tracked her down, especially if she was the love of his life, and although this was the basis of their misunderstanding, it felt off and forced. Another aspect of this trope was Sean’s reaction about his daughter, and the length of time it was kept hidden. You would think his reaction towards Franci would have been more angry, but he seemed to get over it pretty quickly and that’s my gripe about the secret baby trope. I just wished Sean showed more reaction, other than the morning he found out. Nonetheless, I did like that there wasn’t unnecessary angst which sometimes feel forced to me because of the trope. But the matter of trust between Franci and Aiden was re-established pretty easily, although I did think that Franci’s ex would play a major role in being another obstacle but thankfully he didn’t. However the romance between them was good and I liked how it was developed, especially Sean maturing and realising what he missed out on and what was important. The side plot about Franci’s boyfriendm and the revelations about him was a bit redundant and I couldn’t see the reason why this was needed. But I loved seeing more of the Riordan clan and the secondary romance with Sean’s mother, Maureen, was fantastic. She was a hoot, and coming out of her shell and discovering that she could really enjoy life and actually letting go and discovering new love with George (Noah’s mentor and father figure) was great. In many ways there was a parallel between Maureen and Sean, where Sean was settling down and she was becoming more carefree and spontaneousm but they both realised that there are second chances in love. With her beloved younger siblings settled and happy, Erin Foley has got empty nest syndrome. At age thirty-five. So she’s hitting the pause button on her life and holing up in a secluded (but totally upgraded, she’s not into roughing it) cabin near Virgin River. Erin is looking forward to really getting to know herself…not some shaggy-haired mountain man she meets wandering the woods. In fact, beneath his faded fatigues and bushy beard, Aiden Riordan is a doctor, recharging for a summer after leaving the Navy. He’s intrigued by the pretty, slightly snooty refugee from the rat race — meditating, journaling and definitely keeping him at arm’s length. He’d love to get closer…if his scruffy exterior and crazy ex-wife don’t hold him back. But maybe it’s something in the water — unlikely romances seem to take root in Virgin River…helped along with some well-intentioned meddling, of course. I think this was my favourite book in this set of new books. Erin Foley is suffering from Empty Nest Syndrome after her younger siblings – which she helped to raise – have moved out and she is lost on what to do with herself. Aiden has recently left the Navy and is enjoying a summer break with his family in Virgin River, and is trying to figure out what to do with the rest of his life. Their first encounter was humourous and Erin believes Aiden is down on his luck – which he allows her to continue to believe. I did find this amusing as their initial interactions were about hiding behind different impressions of each other, but it allowed them to open up in a fun way. Robyn Carr has a great approach to humour and I loved how she implemented it with Aiden and especially later with the rest of the Riordans. And their interplay felt realistic but with a sense of fun. I also loved how Aiden would help tend her garden that Erin tries to start while she’s holidaying in the woods. However it’s not something she’s happy with in her new setting, and she is quite lonely. And her garden – which is pretty lack lustre with her plants/veggies failing to grow – reflects her situation, where she’s alone and is unable to care and nurture for those she cares about. So I thought it was a wonderful symbolism that Aiden is the one who helps tend her garden, and it becomes a success and reflects what’s happening with them. But soon after they embark in a relationship, Aiden’s ex crazy wife shows up. Although I don’t think she was literally crazy – just an ex from hell. I did enjoy the conflict that she brought to Aiden, and the people around him. Out of the ‘villains’ of these three books, Annalee felt the most real out of them, and made the most impact for me as her manipulative actions didn’t feel forced. I also think Aiden and Erin were my favourite couple who really complimented each other, and I loved the gentle humour and wit they shared. I think the Virgin River books has become a cracklicious series for me to follow. There was one or two books that I didn’t enjoyed compared to previous instalments, but I loved Moonlight Road and I highly recommend this series overall. 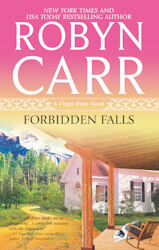 Robyn Carr has a real talent and insight for creating lovable and memorable characters with a good dose of humour. And the Virgin River books are great to pick up if I need a nice change of pace, especially if I’m in danger or burning out on another genre. They are a great comfort read for me, and I’m looking forward to the new set of books set in this close knit town of Virgin River. Note: for FTC purposes these ARCs was provided by Netgalley.